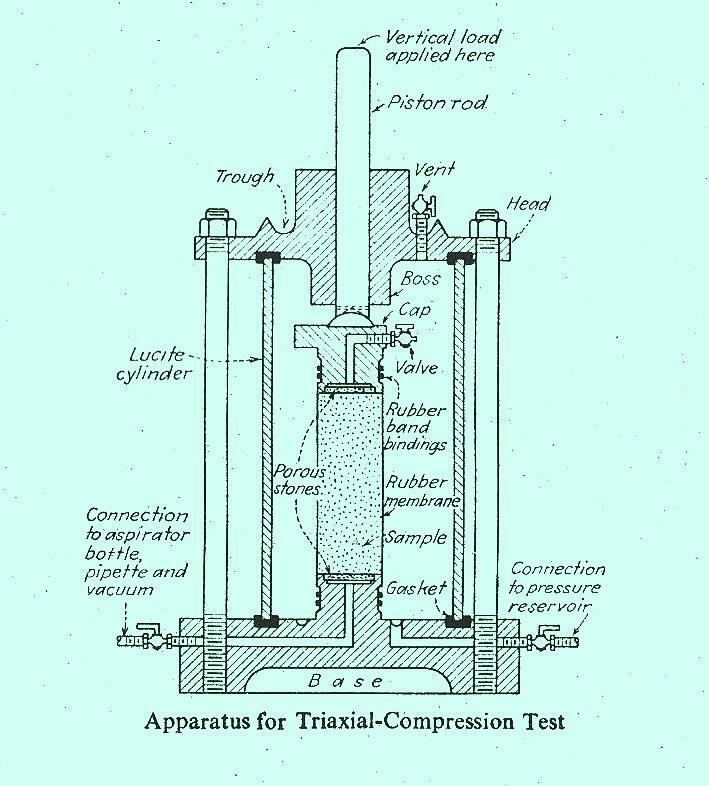 Triaxial Compression test is used where more precise values of the cohesion and angle of internal friction of a soil are required than determined from a shear box test. The specimen of the soil is subjected to three compressive stresses at tight angles to one another, and one of these stresses is increased until the specimen fails in shear. The test differs from the shear box test in that the stresses determine the plane of shear failure which is not predetermined. In this test a cylindrical specimen usually 40 mm dia. and 75 mm long is enclosed in a thin rubber membrane and is subjected to radial fluid (water or glycerine) pressure. Increasing axial stress is applied at the top until failure occurs. The test is repeated with different pressures and the results are plotted in the form of Mohr’s circles. The triaxial apparatus is probably the most useful for research into the fundamental properties covering the strength of soils but is elaborate. The undrained triaxial test is, in general, used as a basis for estimating bearing capacity, earth pressure and slope stability of cohesive soils. Unconfined compression test is used for predominantly clayey soils which are saturated or nearly saturated.